36 University » Total Solar Eclipse: What Do I Need? Total Solar Eclipse: What Do I Need? The Great American Solar Eclipse is less than two weeks away! Monday, August 21st will be here soon. If you’re in the path of totality (as we explained in our last blog post) or near it, it’s time to start thinking about what you need for your best eclipse viewing experience. You probably already know you’re not supposed to look directly at the full or partially-eclipsed sun with the naked eye. So that you can watch the eclipse as it progresses, get eclipse-viewing glasses with NASA-recommended ISO 12312-2. 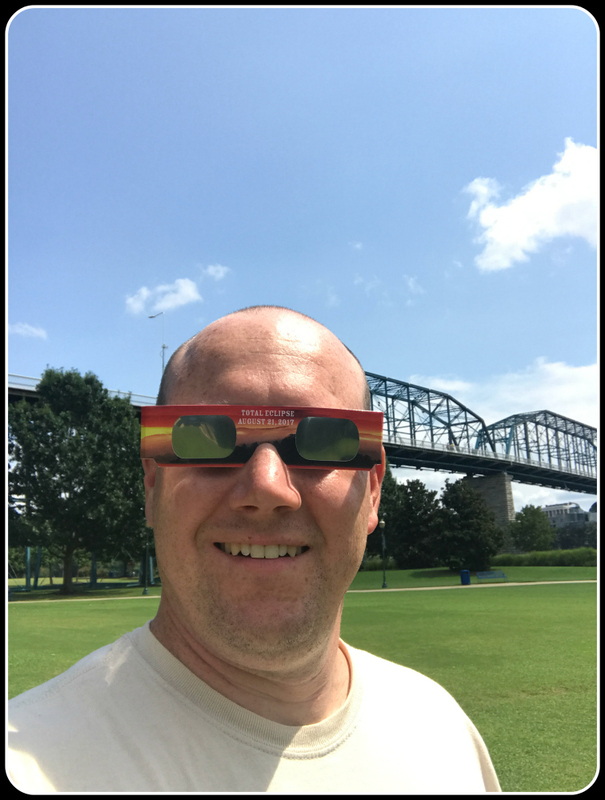 Regular sunglasses are NOT safe for eclipse viewing. NASA has specific tips here to help you be safe while enjoying your eclipse viewing. This same article goes on to list places carrying eclipse glasses. You can find them at retail stores such as Lowe’s, Walmart, Toys “R” Us, and Kroger, as well as convenience stores such as 7-Eleven, Circle K, Love’s Travel Stops, and Pilot/Flying J. A more comprehensive list is in the article. 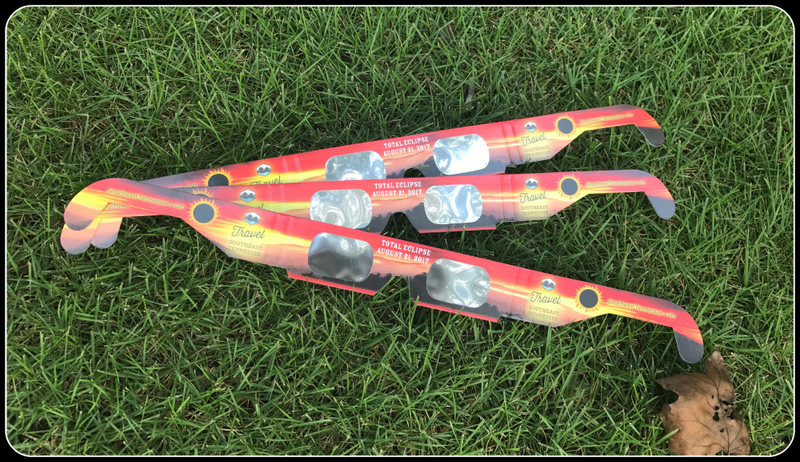 Some public libraries and other public organizations have free eclipse glasses, so it’s worth an internet search to see if any place near you is giving them away. We at 36U have found it’s too late to order online and receive delivery by the eclipse date, so your best bet now is to find a free source locally or go to a local store. 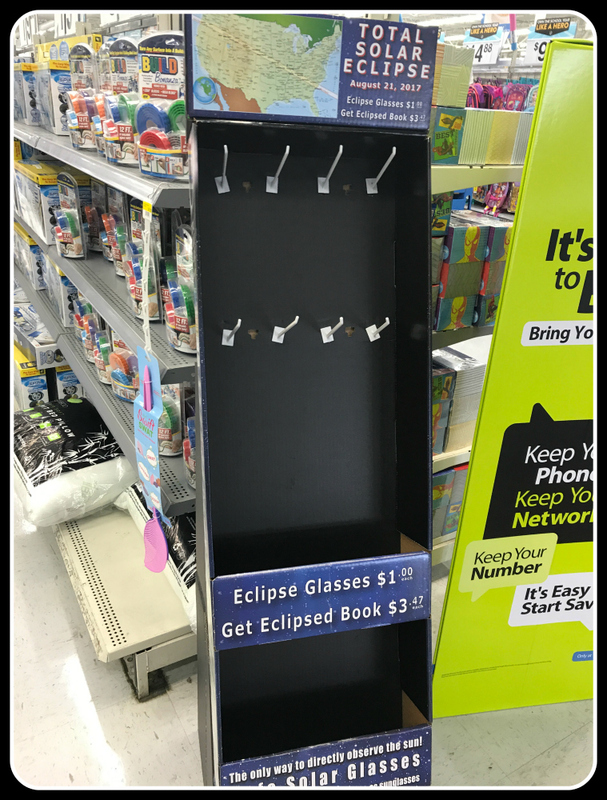 We even found empty eclipse glasses displays locally. So you may have to go on a hunt (as we did) to find your glasses before the 21st! We know a lot of you will want to try some photos of the eclipse on your phone. Here’s some advice from Mr. Eclipse on how to do that. Finally, don’t forget plenty of water and sunscreen and whatever you need to entertain yourself during the two-and-a-half to around three hours that it will take for the eclipse to run its whole course from beginning to end.